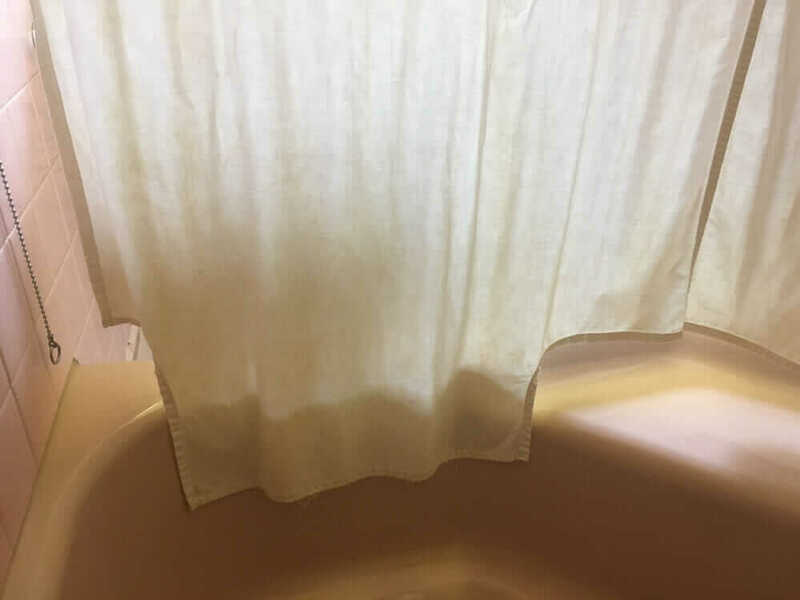 Do you have a Cinderella bath tub and wonder how, originally, a shower curtain was supposed to work? And what about the shower curtain rod? 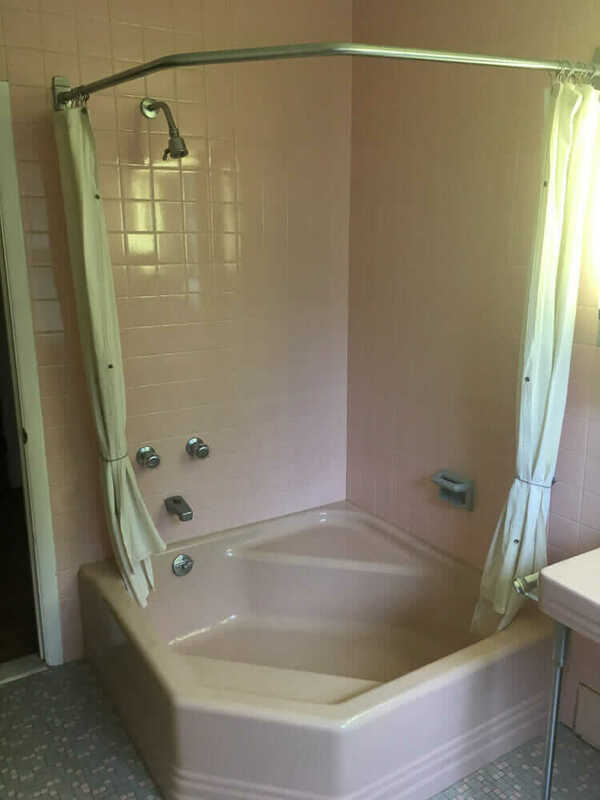 Today, Carolyn shares hers — original to her new-to-her 1959 bathroom. 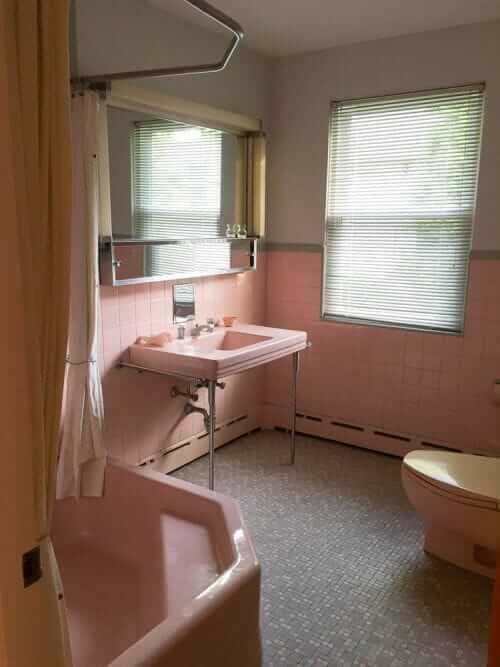 Oh, what a bathroom — an original-condition 1959 pink bathroom that dreams are made of — fabulous tile work, Cinderella bath tub, gorgeous sink on chrome legs, and an equally gorgeous lowboy toilet — oh my! Carolyn has shared lots of photos — and has some questions for us before she even moves in. I am the proud new, second owner of a 1959 split level. Amazingly, the owner was a plumber and his brother a tile layer, so my bathrooms are pretty darn cool. 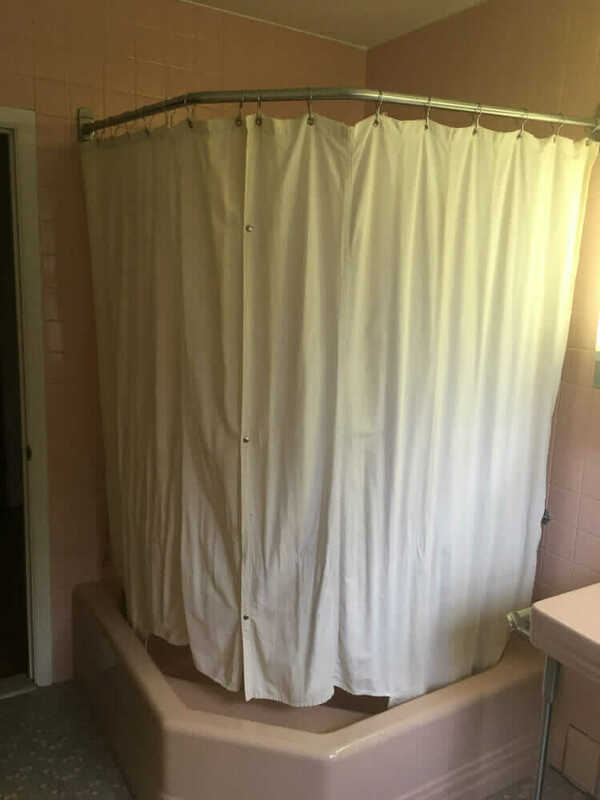 This is my favorite… pre-decorating. I say decorating as that’s the only change this bathroom will get. The wallpaper was stripped between realtor 1 and realtor 2. Apparently few people in my area were enamored of this as I am. — to show the shape of the original Cinderella shower rod since I’ve seen others ask. 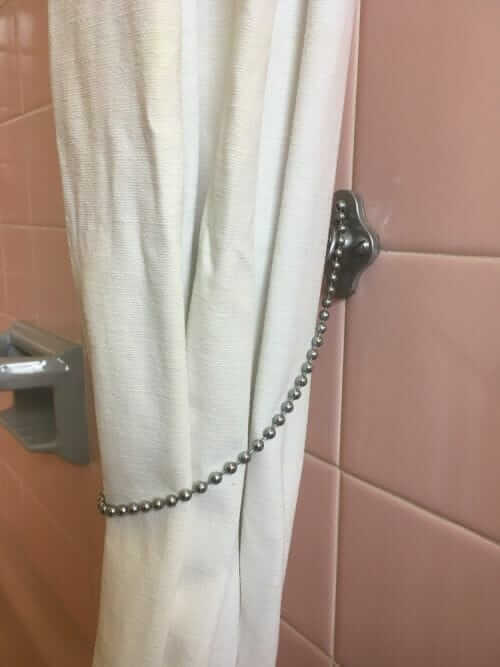 — to confirm that those hooks are intended to hold back the shower curtain. Mine have a little ball chain attachment for this purpose. This is not the original toilet. When it needs to be replaced plumber dad searched long and hard to find the best possible color match. It is more of a coral than a pink. It also has built in venting. 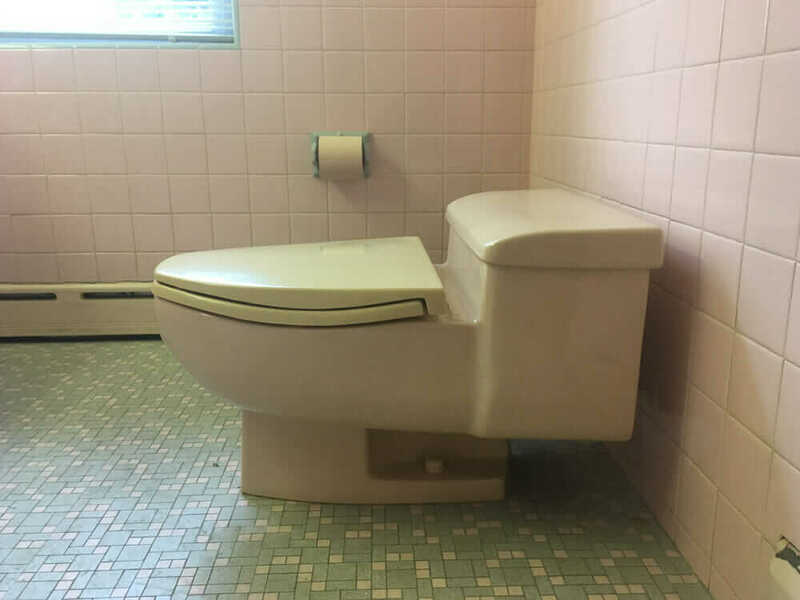 The told me many times that this is a $1,000 toilet (in ’70s money). I will keep it as long as I can, but I do think it uses about 80 gallons a flush, which hurts my heart having previously lived in a drought zone. Although the is the hall bath, the two boys were not allowed to bath here. They used the (blue tiled) master shower. This was mom’s bath only. And she always bathed, never showered. They left me one all of pink toilet paper they found in the linen closet. I am trying to save it for guests but it is hard to resist. 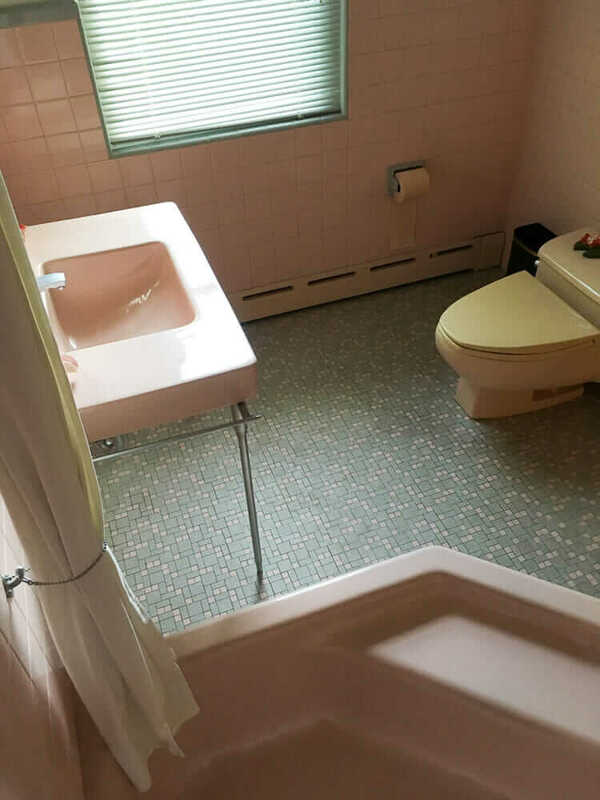 Anyway, I’ll be seeking much advice and tips from your site — for instance, where can I get those grey and pink mosaic tiles if I do have to replace the toilet — should I go ahead an buy a pink toilet now in case they’re discontinued before I HAVE to replace this one? So, I thought I’d send this now before things get too crazy…. Thank you, Carolyn — We all want your bathroom, I am confident in saying. Q. Buy a new, lower flow toilet now, or wait? Suggested answer: Get your spare now. If there’s one thing we’ve learned on this blog, it’s here today, gone tomorrow, when it comes to vintage stuff still made today. Well, not always, but usually. Relevant case in point: there used to be two, but now there is only one place left to get a pink toilet, see this story. I’d say, get it now and store it ’til you need it. Or, when you find your extra floor tile, make the switch then. Q. Where to get vintage unglazed porcelain ceramic floor tile? Suggested answer: Vintage. 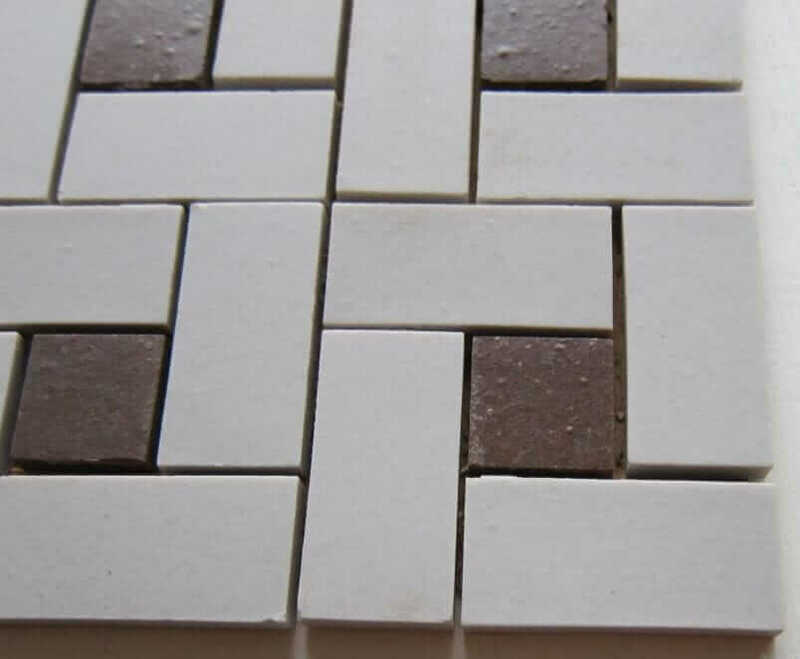 That -random block mosaic’ style of flooring you have — looks like unglazed porcelain to me, but I am not an expert — was quite common back in the day, but it is not made today in those colors and dimensions, as far as I know. So, start hunting for a vintage match now — maybe you’ll find a sheet or two within… five or 10 years. I’d set up saved searches in ebay. — on ebay right now — not what you are looking for exactly, but of the era. Note the very very narrow grout line — that’s because these were mud-set (set in concrete); these old style mosaics had very minimal grout lines, unlike mastic-set tiles today. — it’s free to ask if they have what you need! Note: All these links to ebay are affiliate links — I earn a wee commission if you click and buy something. Another thought on where to find replacements: Get to know your neighbors, could be they used the same floor tile. Note, I could be that your toilet is sitting on perfectly preserved floor tile and that when you take it up the hole will be just where you want it to be. If either are not… it’s probably going to be hard to ‘tear’ out and ‘move’ any of the floor tile — because it’s set in concrete, aka ‘mud set’. Good luck with your new-old house, Carolyn! Send me a photo when you’re done decorating! As a general rule, the tile should have been installed right up to the drain under the toilet. A new throne should not require additional work on the floor, just a new wax ring. I’d still be looking for matching tile though, in case of accidents! 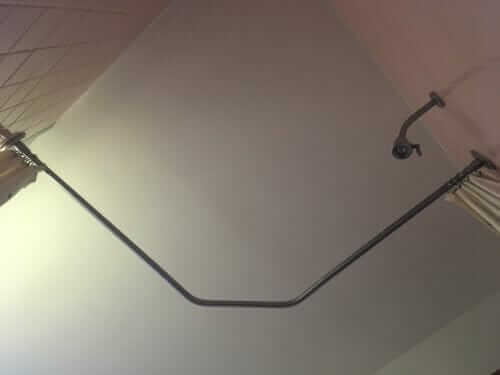 The standard rough-in for a toilet flange is 12″ from the center of the flange to the wall. It has been 12″ for decades. Therefore, the bolt holes in the base of the toilet that straddle the flange are placed accordingly and are standard regardless of manufacturer or style of toilet. Doesn’t matter if the toilet was manufactured 70 years ago or this morning. 10″ and 14″ rough-in toilets are also common. Remove a flange bolt cover and measure from the center of the flange bolt to the wall. The distance should be be 12″ – 12 1/2″ or 14″ – 14 1/2″. If it is the latter, then it is a matter of purchasing a 14″ rough in toilet or purchasing a 12″ rough-in toilet and installing an off-set flange. Neither solution should require additional tile. Thanks to all posters for the compliments and suggestions. I honestly wouldn’t have thought of the tile issue except the seller made a comment about it when we did the walk through. In another incredible burst of luck-I found some extra matching tile in the basement. So I’m set. I WILL be ordering the pink toilet this week! (Although I likely won’t install it for a good long while.) When I do, I will call the sellers who are still in business and I know they will do everything to preserve the beauty. If there is a linen closet the tile probably extended into there- that is what our does in our 59 Raised Rancher. 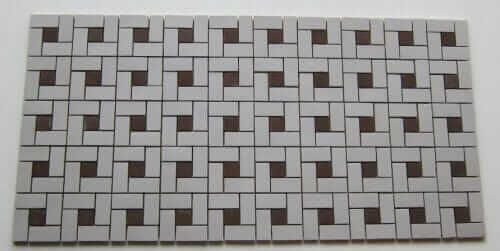 We have the same tile you link above but in black & white. It would be a pain but you could try to steal from there dependeding on how much tile you needed. Might end up with more broken tiles the intact but worth a shot. And I’m in love with this bathroom. I’d bathe everyday in that tub ifnit were mine. AND I too, would make my boys shower elsewhere. Thanks! Great idea on the linen closet. We do have one, but the floor is hardwood like the hall. Luckily, I found the secret stash so I’m good. I have two girls (instead of the first set of boys raised there) so I don’t think I will be able to fight them off! We have two bathrooms with unglazed porcelain tiles. I spend a lot of time keeping them clean. What is your best advice for a more permanent solution to this weekly ritual of hand & knees scrubbing? Is there a sealant that can be applied that will not ruin the original look of the tile? I don’t know the answer to this question, Shann, and since slips and falls can be a safety issue with tile, I recommend you consult with experts. PEOPLES: Get with your own experts when it comes to safety advice. I do not approve comments giving safety advice; so just don’t, please. Thank you ! I am not looking forward to cleaning all the tile so much. But, it’s worth it. I read up a little and bought an enzyme cleaner and sealer. I will, of course, test a small area first, but I’m optimistic the sealer is the key. Now I just need a free weekend. You are so lucky to have found a house with this dream of a bathroom! It is just beautiful. I would love to see your other bathroom too! The usual measurement for the toilet is 12″ from the wall to the center of the hole. They also 14″ from the wall to the center of the hole. I found this out the hard way. When we moved our toilet in “Lynne and Bob’s Blue Bathroom” the 12 ” mark hit a joist. Our plumber said he would never cut a joist, so we had to move it forward to a 14″ center. Luckily, with the new Lynne and Bob’s Master Bath remodel, the joists were fine and we used the regular 12 inch center.